I’m not an expert on Twitter by any means. For the longest time, I didn’t “get” Twitter at all. I mean, why say something in 140 characters if you can also say it in a real sentence on your blog or on Facebook? Why would I want to “follow” people if I can just read the news all by myself, thank you very much? Okay, so I get it a little bit better now, but barely. I still don’t quite see how people can keep up with so much information. Do people actually READ the information in all of the links they get presented in their Twitter stream? I do get it on the other end. I tweet with the best of them (when I have the time). Every time I have a new blog post, I tweet the link, or if I can think of something witty to say in the area I consider my expertise (like anything #kilimanjaro, or anything #writing, with silly stuff like #eishkom thrown in occasionally), and a few times each week I am rewarded with the occasional new follower. But again, how do people actually have time to read the stuff I post on Twitter before, like, 2 seconds later the next tweet flashes on their screen? I guess I’d have to become a trend. I haven’t figured out how yet. But my suspicion about Twitter (and Facebook, for that matter) is that everybody sits there tweeting links like crazy, and that’s all that ever happens. No one has time to actually READ anything. Sometimes I am confirmed in this by a nasty comment about a blog post of mine and how COULD I SAY SOMETHING SO TERRIBLE ABOUT SOUTH AFRICA? I then always feel like I have to EXPLAIN what I actually wrote, because it is evident the complainer only read the headline or looked at the picture but has no clue what I actually said in the article I linked to. Still, you need a Twitter account. Your book will need all the help it can get, and if Twitter is where people are hanging out, you should have a presence there, if grudgingly. Announcing your book launch date is a good start. 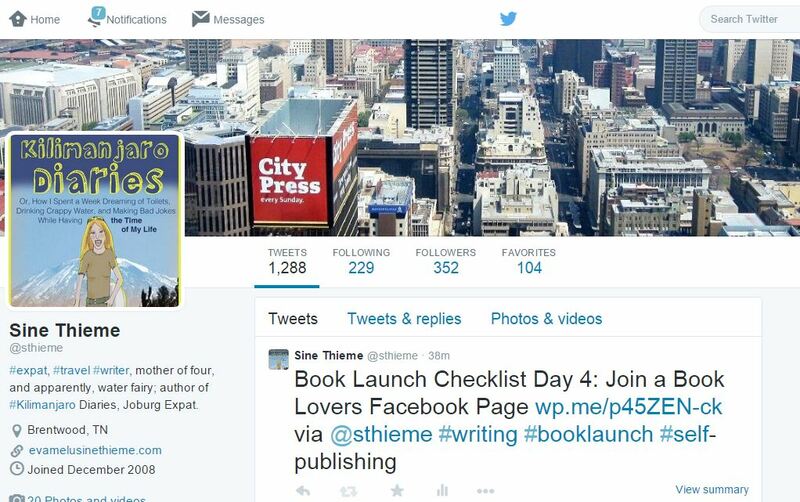 Oh great, I just noticed looking at this picture that #self-publishing doesn’t work as a hashtag with the dash. See what I’m saying? I have no f*ing clue about using Twitter. Don’t repeat that. I’m sorry if today’s Book Launch tip wasn’t very enlightening and rather a rant about social media. One thing that does speak for Twitter versus Facebook is the fact that everything you ever tweet is shown to all your followers that you’ve so painstakingly earned. Will they read it? is another question, but they do get to SEE it. Whereas God knows how Facebook decides who they show stuff to. Not nearly everyone who has expressed an interest in your page by “liking” it, even though that seems the common sense thing. Some people are able to boost their followers on Twitter by a simple game of “if I follow you will you please follow me back,” which to me just sounds like one big pyramid scheme without any gain. Because obviously your new “followers” aren’t really interested in your stuff. I’m therefore always a bit suspicious of people with the same number of followers as they are themselves following, but hey, perhaps that totally is the way to go. I frankly just don’t have the energy. By the way, with a regular free Twitter account, you can’t schedule tweets ahead of time, at least the last time I checked. But scheduling ahead of time is actually a handy-dandy tool for the time-pressed and only occasional Twitter user like me. I like to set blocks aside to post interesting content on both Facebook and Twitter, something that will hopefully increase my following and thus readership, but of course I don’t want to send out 5 tweets at 8 am, followed by nothing for 3 days. I want to space out my tweets. The solution that works for me is a tool called socialoomph. Go check it out, it’s self-explanatory. I did a campaign once tweeting out #expattips of the day, and I scheduled all 50 or so ahead of time, a great time savings. That’s it for Twitter. But please, try to find some better advice somewhere else. With barely over 300 followers, I am definitely no Twitter authority.